It looks like she…*puts on sunglasses*…spins a good yarn. Sorry, had a David Caruso/CSI Miami moment there. I normally spin by weight. 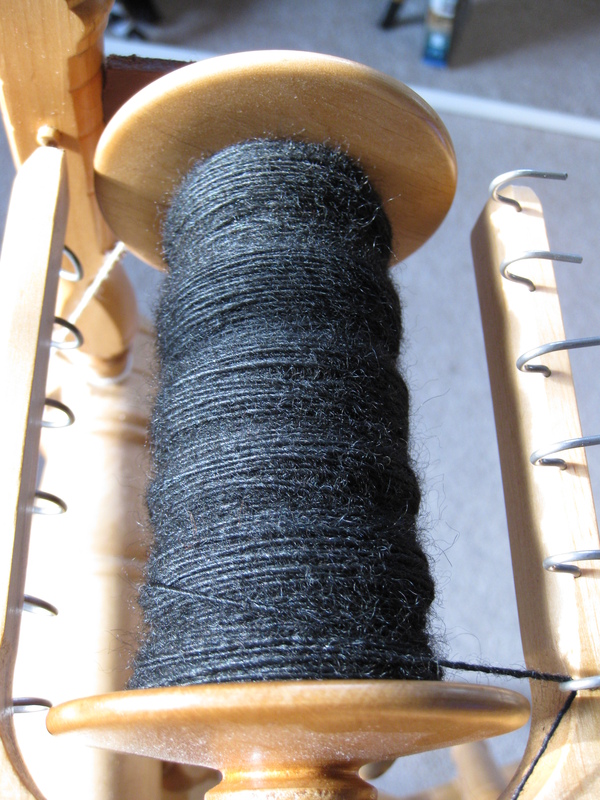 I spin two ounces of a single on one bobbin, then two on another bobbin. Even when I am super careful about moving the yarn from hook to hook on the flyer, so that it winds on to the bobbin evenly, it’s kind of hard to tell just by eyeballing it whether or not I have the same amount of singles on the bobbin before I ply. Unfortunately, I have no idea where the postage scale is. So I’ve switched to measuring how much yarn I’ve produced in easy time increments: number of CSI episodes watched per bobbin. As an example, let’s take the “Black Lace” yarn I just completed. It took me two episodes to spin one bobbin, and two episodes to spin the other. The next day, I added more twist by spinning each bobbin again (one episode per bobbin). Plying the whole thing took another two episodes. So let’s see…that’s 8 episodes at 43-ish minutes a pop…344 minutes or 5 hours 45 minutes. Not bad, for 215 yards of yarn! And one more thing, to be clear: I don’t watch CSI Miami. That show is silly. I’m all about old school CSI or CSI New York (which are NOT silly…right? RIGHT??). Though, watching crime dramas might violate my “think happy thoughts while spinning” mantra. My first choice yarn name was actually “Black Dahlia”. I didn’t even mention that one to marketting (Mom). This entry was posted in fiber art and tagged art yarn, crafting, CSI, david caruso csi miami, diy, episodes, hand spinning, plying, spinning, spinning wheel, TV, yarn. Bookmark the permalink.